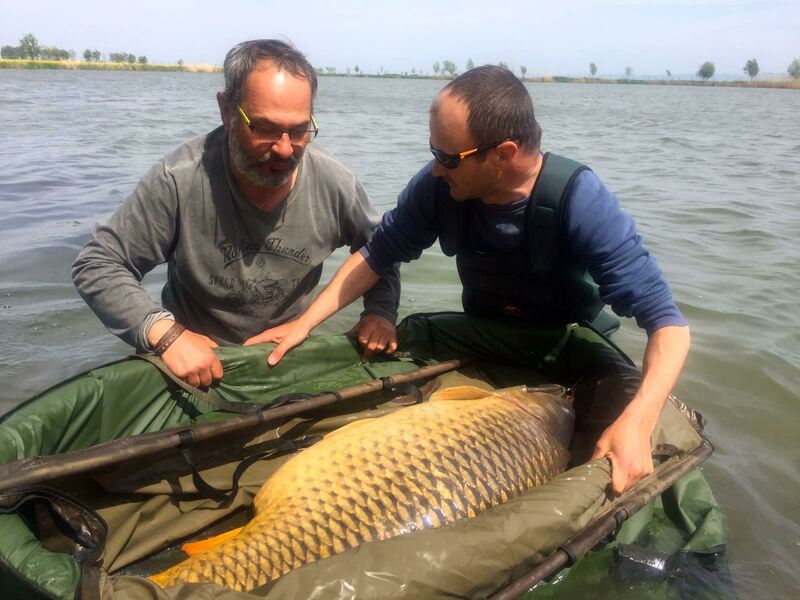 Recently the common carp record for Romania was broken on Monster Carp Lake. Romanian carp angler Cristi Olaru managed to land a beautiful 34,65 kg specimen (76lb 4oz) nicknamed 'Dynamite'. 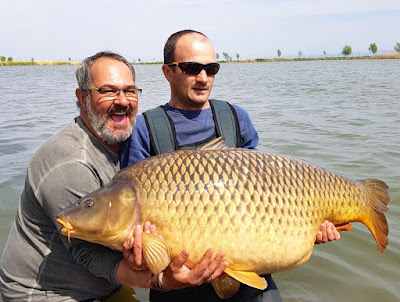 With his capture Olaru broke the long standing record from Tim Paisley with a 34,5 kg (76lb+) common carp from Raduta Lake in 2001, more than fifteen years ago. 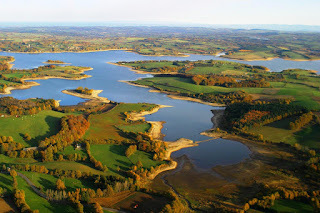 Monster Lake is a 6 hectare venue in Siclau, Arad county in Romania. It has 3 double pegs for a total of 6 carp anglers. Previously the record for Monster Lake was 31,85 kg, and dates back to 2016 when Kristof Cuderman from Slovenia captured another big common carp. The new record holder Cristi Olaru is a fanatic carp angler from Bucharest. Olaru fished on Monster Lake from April 23 to April 27. During his stay at Monster Carp Lake he already broke his personal record with a 24,5 kg common carp, followed by a 24,6 kg mirror the next day. The big reward of course was the 34,65 kg record common carp for Olaru, who used Dynamite Baits CompleX-T boilies. 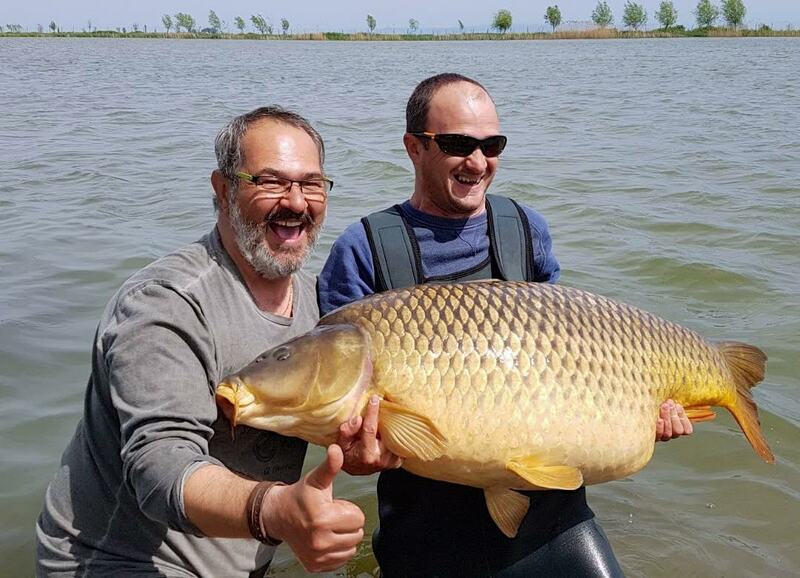 Monster Carp Lake owner Ioan Vida had to support Cristi Olaru (with beard, shown left in the pictue above) who couldn't lift the massive carp because of his medical condition. Since the record breaking common carp was, just like last year by Cuderman, captured with Dynamite Baits boilies, the fish is nicknamed 'Dynamite'. According to Olaru it won't take long before Monster Carp Lake will have its first carp over 40 kg, breaking the overall carp record for Romania. Christian Baldemair still holds the record with a mirror carp of 82lb 3oz from Raduta Lake. This fish was captured almost 20 years ago in 1998. Read the full article about the new common carp record for Romania on the Dynamite Baits website. For more information about Monster Carp Lake please check out the facebook page.